Big Brother Naija housemate, Teddy A was evicted from the reality show today. Recall, the rapper wept last night after his romantic partner, Bam Bam was evicted in a shocking manner yesterday. 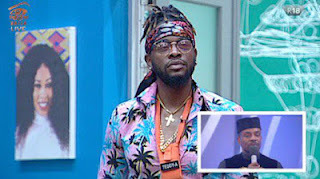 He has joins other evicted housemates, Ahneeka and Angel, Bitto and Princess (Pritto), Vandora and Dee-One (Van-Dee), Leo, Ifu and Teddy A"s one and only in-house lover, Bambam.